The landmark EU-Turkey migrant summit deal may already be failing as Greece decides to postpone deportations in large migrant camps. There were no deportations of migrants from the Greek island of Lesbos on Tuesday because, according to the Greeks, there were suddenly no migrants eligible for deportation. A Turkish official, on the other hand, claimed that 200 migrants will be returned to Turkey on Wednesday, though there has been no confirmation of whether this will happen reports Spiegel online. The European Union Commission seemed in the dark about the whole affair and the spokesman for the commission refused to comment on questions from journalists who asked about the sudden stop in deportations. “We can’t give out any information,” a spokeswoman told press. They are said to be solely focusing on migrants who have filed asylum applications, which has not stopped even since the EU-Turkey deal came into effect on Monday. Many of the migrants currently residing in the Greek island had not previously applied for asylum in Greece. They were all worried that if they applied for asylum there (as per Dublin agreement regulations) they would be stuck there and not allowed to go to Germany. Now the EU is saying that all migrants who have not applied for asylum are to be considered illegal and must be deported back to Turkey. The new problem authorities on the ground are facing is that these migrants are now applying for asylum en masse. Of the 3,000 migrants on Lesbos, most have now applied for asylum and until a decision is reached, they cannot be deported. Case-by-case, every migrant will be assessed and it will be decided whether or not Turkey is a safe country for them to return to. A Greek government official said that the only people unlikely to be going back to Turkey are Kurds. NGOs and international organizations are arguing that Turkey isn’t safe for Syrians either and have accused Turkey of deporting Syrians to their home country, and effectively into a war zone, last week. The largest migrant camp in Greece is at the border of Macedonia in Idomeni. The Greek government has announced that it expects a total vacation of the camps by the weekend. 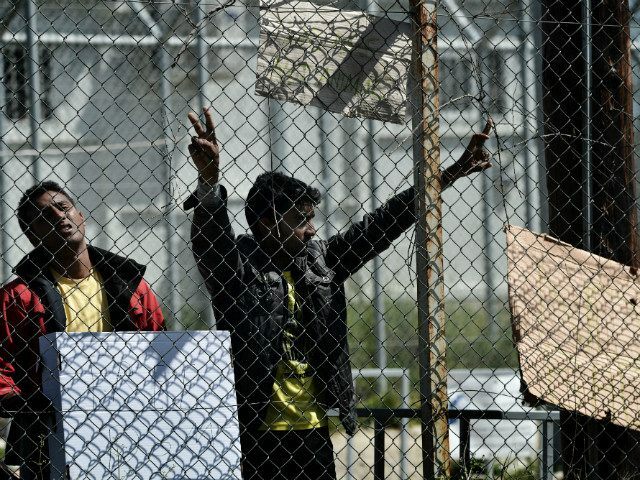 Athens said the camps in the port town of Pireaus would be under the same schedule according to Junge Freiheit. Greek media is reporting that thousand of migrants have so far flat out refused to leave the area even though buses and other methods of transportation have been allocated for them. Open borders activists, who some say were responsible for the deaths of three migrants who drowned in a river in Idomeni, have advised migrants to stay where they are. Despite the situation in the camps, which has led to miserable conditions in which migrants have spread disease, and violence has often erupted, they have so far chosen to stay. The activists tell the migrants that the misery of life in the camps is good because it shows the world their situation and that it will lead to authorities opening the borders to the Balkans.